The chariot on the side of this circa 1830 bandbox is a quadriga and is found on ancient coins. Americans became enchanted with ancient Rome after the discovery of Pompeii and Herculaneum in 1748. Classical Greek motifs and design were revived when Thomas Jefferson completed Monticello in 1809 and the University of Virginia was built upon Jefferson's classical architectural designs in 1825. Americans showed their passion for classical designs with wallpapers and fabrics. 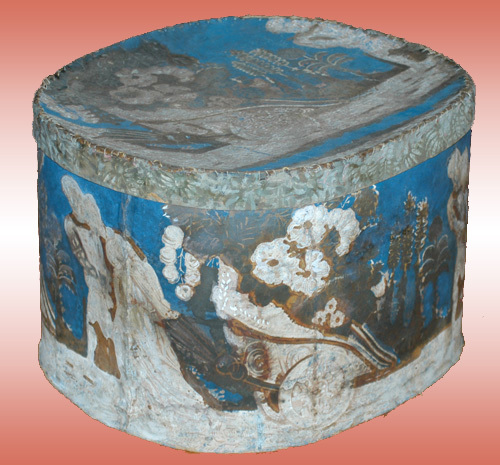 The handblocked wallpaper used in this bandbox was much too expensive for the masses to use on their walls. Therefore, more affordable bandboxes extremely popular as a way for fashion conscious Americans to bring the best designs into their homes. This is a very desirable bandbox with vibrant colors to show off this classical design. 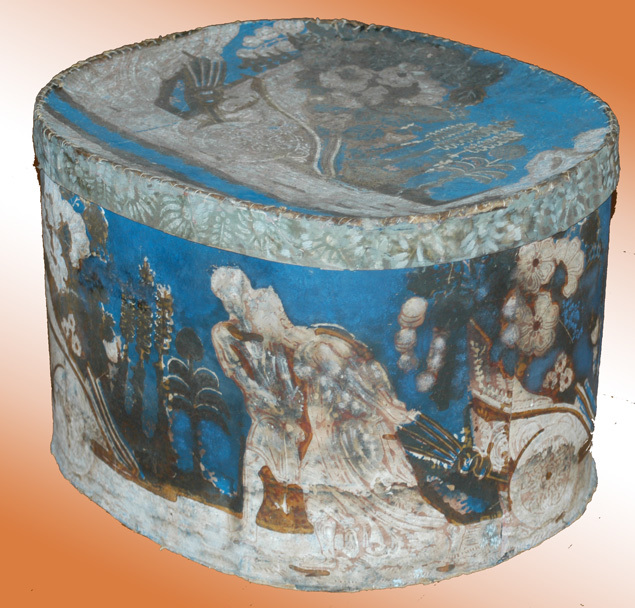 See Lilian Baker Carlisle, Hat Boxes and Bandboxes at Shelburne Museum at 140-42 for photos and description of Shelburne's box. 17" x 14 3/4" x 11 1/4" tall.